Does your young musician struggle with performance anxiety? Do they need tools to be successful in auditions and interviews as they apply for college, scholarships or jobs? Our summer improv intensive will teach them to think on their feet and respond without fear. 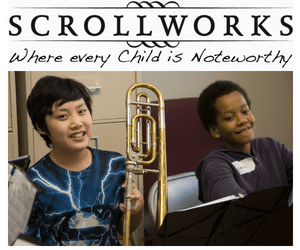 This summer, Scrollworks and Positively Funny Improv will give youth musicians –and young people interested in music– the opportunity to set their musical creativity free! All classes will be held at St. Paul United Methodist Church, 1500 6th Ave N.